Today's random set is 4416 Robo Pod, released in 2006. It's one of 21 Creator sets produced that year. It contains 65 pieces, and its retail price was US$3.49/£2.99. It's owned by 1553 Brickset members. If you want to add it to your collection you might find it for sale at BrickLink or eBay. I found these pods, back in the day, really useful for random, unusual parts that I couldn't find anywhere else. Catchy little hashtag, right? I bet it’ll go viral. Wow! Nice robot! 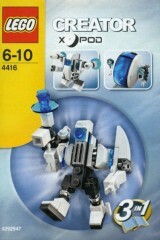 I think it looks like a mini version of Zane's ice mech (or whatever the proper term for it is...) from season five. I got this one, one of my favorites. I would latch it to to the bottom of a small creator jet so it could airdrop the robot on missions. Fondly remembering the models made and used in Lego Universe. This is how you make a pod LEGO, not the new ones that somehow cost $9. That robot is actually quite a fun little thing in real life. I managed to get all of the originals (including the Black Robot pod) but I only managed to get this pod out of the second wave. I wish the more colourful ones were released in the UK,, like the monster pod and spider pod, but I had to make do with what I had. Aww I had this. Bought it from Woolworths. The pod kicked about my Lego box for years and now I use it for all the spare stud shooter studs. I've commented about my history with X-Pods (and the Play Off board game) before, so instead of repeating myself, I'll share something different. The original wave of X-Pods was released just before I entered my Dark Ages, and in the 2 or 3 years leading up to that I started having the foresight to take really good care of my LEGO sets at the time, ensuring that nothing went missing or got scavenged for parts without at least keeping record. All my X-Pod MOCs I made when I was 14 — when I had just entered my Dark Ages — remained in excellent condition until I took them apart last year. I plan to build something new out of them (and the pods) in the near future. The third wave of X-Pods annoyed me because there was no consistency in the pod colors: White/trans blue, orange/trans red, blue/trans yellow, and yellow-green/clear. In Wave 1 all of the canisters were clear, and in Wave 2 all of them were the transparent version of the lid color.